Today during a press presentation at Disneyland Paris more details surrounding the new Ratatouille themed ride and land (appropriately named La Place de Remy) were released. Previously, we had reported on the name of the ride as well as speculation that the ride vehicles would be on a new innovative trackless system, but now we have a lot of new information. While the Disney imagineers work tirelessly to keep surprising guests it was interesting to hear how much collaboration between Disney and Pixar was done to make La Place de Remy 100% authentic to the original film. "[This is] by far the most advanced and sophisticated thing we've ever done from a ride integration standpoint. It will offer guests a totally immersive experience into a Disney•Pixar adventure". 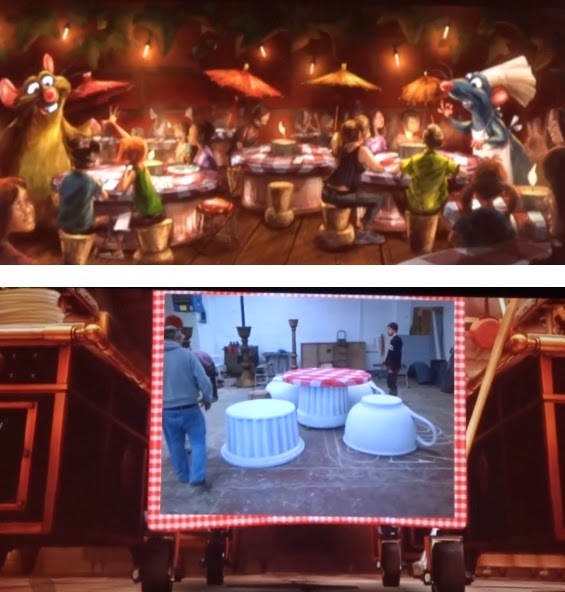 The presentation also gave a quick mention surrounding the Ratatouille themed restaurant. This new restaurant will no doubt be yet another crowing achievement in Disney Imagineering as guests will be transported to feel like they are rat-size as they dine on saucer cups once they step inside (as pictured above). All of these exciting new details surrounding La Place de Remy have us wondering if perhaps there will be a Colette, Linguini or even a Chef Skinner meet and greet area. We also think that a great addition to the land would be the Health Inspector's car parked near the Ratatouille ride or near the restaurant. There are so many great ideas we could come up and we're sure you have some ideas too - be sure to share your thoughts with us and other Pixar fans on the Pixar Post Forum. You can view the presentation thanks to DLRPWelcome.